Plenty to say as usual. I just don't particularly feel like it. I have a couple of surprise guest treats coming your way soon, so stay tuned! In place of the normal nonsense, here are two reviews. "Those don't go together very well. Couldn't you have picked beers to compare and contrast?!?" Nope! 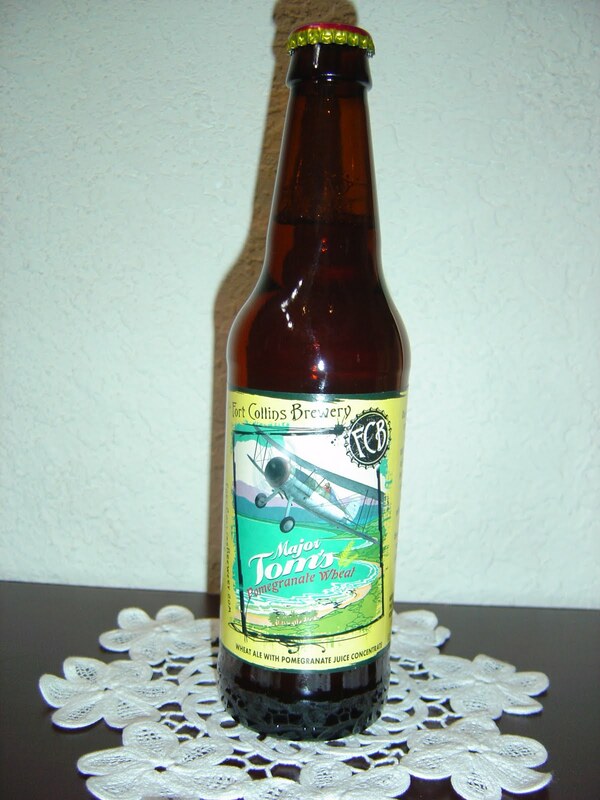 Tonight I am starting with Major Tom's Pomegranate Wheat brewed by Fort Collins Brewery in Fort Collins, Colorado. The label says this is their "most unique creation". There is a beach scene with a bi-plane flying overhead. This is a wheat ale with pomegranate juice concentrate. Fruity aroma, I guess those are pomegranates. Wheat too. A very bright, floral aroma. Very wheaty flavors with high carbonation start things out. Mighty prickly! Some citrus and tart pomegranate flavors dart in and out but are not a large factor. This beer is a little sour, too. Strange overall with the aggressive carbonation combined with dominant one-dimensional wheat flavors. The texture was dirty. Just an OK beer. Tonight I'm also drinking Steelhead Porter brewed by Mad River Brewing Company in Blue Lake, California. This is a Scotch Style Porter. 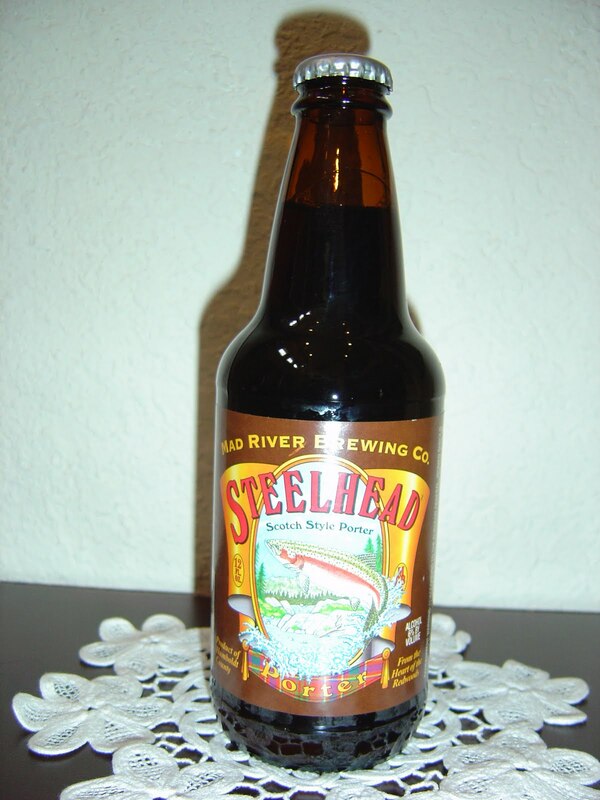 The label has a fish, presumably a Steelhead (but I am not the one to ask), jumping out of a river. Caramel and butterscotch aroma, like a Werther's candy. Caramel and chocolate and that butterscotch again right up front. Pretty nice flavors to start. Not too sweet though. In the background there is a hint of coffee and smoke, maybe some nuts. Burnt flavors are there but not harsh--rather, this is darn smooth. Low carbonation, medium body, balanced. Nice aftertaste. Best part: the butterscotch flavor; worst part: carbonation was too low. An all-around nice beer to check out if you can. Completely as a non-related aside, I LOVE those cookies. I even dream about them. Yeah, Hannah. When I lived in New York, I had them all the time. But I probably haven't had once since moving to Florida in 2002. I like tasting very contrasting beers together. It brings out all their peculiar little idiosyncrasies and you can really pick out the unique flavors, whereas, when you're tasting two very similar beers sometimes, they get lost in each other. I agree, Marie. I don't know how a beer judge can sit down and drink (sample, whatever) 10 of the same beer and pick a winner. Don't the flavors start to run together after a bit? Well then Beer Drinker, perhaps I'll have to include some in your care package when we swap. Have you ever thought of reviewing more foreign and U.S. macro beers instead of all craft beers? Great question. I have nothing against foreign beers or even macros, and I have reviewed many. I am totally not a snob! Foreign: I'd guess at least 20 between England, Germany, France and Italy plus a dozen or more in the Caribbean and Latin America. That's almost 10% of the Total reviews here. Many macros are also hidden behind different names b/c the macro breweries want to trick you. Blue Moon? Shock Top? You get it! Guinness? Dos Equis? Those are foreign and macro. In the end, however, I am currently loving the US and sometimes Canadian and Belgian beers right now.